BAINBRIDGE ISLAND, Wash. — The Bainbridge Island Japanese American Community (BIJAC) in Washington state has launched a fundraising campaign, using the Kickstarter website, for a documentary about Military Intelligence Service veteran Roy Matsumoto, one of the lesser-known heroes of World War II. Gen. Frank Merrill presented the Legion of Merit to Staff Sgt. Roy Matsumoto for his outstanding service with Merrill’s Marauders. BIJAC and Stourwater Pictures plan to make “Honor and Sacrifice: Heart of a Patriot, Face of the Enemy,” a broadcast-length film will memorialize the extraordinary contribution of the MIS, “presented through the story of my 99-year-old father,” said Karen Matsumoto, who is working with filmmaker Lucy Ostrander on the project. Born in Los Angeles, Matsumoto is a Kibei, raised by his grandparents and educated in Japan. He returned to Los Angeles, and in 1942 was among more than 110,000 Japanese Americans living on the West Coast who were rounded up and incarcerated. He was sent first to the Santa Anita Assembly Center and later to Jerome camp in Arkansas, from where he enlisted in the Army. Matsumoto was one of 14 Nisei volunteers who volunteered to serve with a unit called Merrill’s Marauders behind enemy lines in Burma. The mission was so dangerous that most of them were not expected to make it back alive. Due to his invaluable Japanese language skills, he emerged a hero, credited by other members of his battalion with saving their lives. His story and those of his Kibei comrades are the more poignant and powerful for the fact that most of their parents and grandparents had been born in Japan, which made itself the enemy of the U.S. with the bombing of Pearl Harbor in 1941. His brothers fought with the Japanese Imperial Army in China and Guadalcanal, and his parents were living in Hiroshima when that city was destroyed by the historic first use of an atomic bomb. 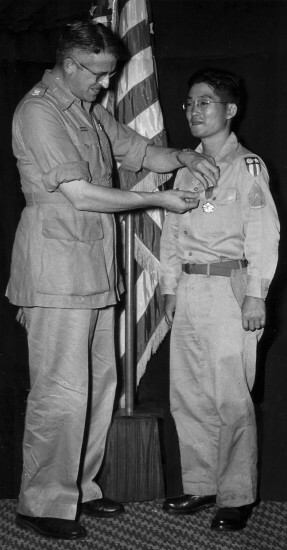 Matsumoto is one of the most highly decorated Nisei soldiers of World War II, and has the distinction of being honored in both the MIS and Ranger halls of fame. The service of the Nisei linguists in the Pacific Theater was so successful that it prompted Maj. Gen. Charles Willoughby — Gen. Douglas MacArthur’s chief of staff for military intelligence — to say that the Nisei shortened the Pacific War by two years and saved possibly a million American lives and billions of dollars. To learn more about the film and donate to this project, go to: http://www.kickstarter.com/projects/stourwater/honor-and-sacrifice-the-roy-matsumoto-story. Roy Matsumoto is a life member of the JACL, and was active in the Berkeley chapter when he lived in the Bay Area. In 2011, he received the Berkeley JACL Pioneer Award for his contributions to the Nikkei community. He moved to Washington state about 12 years ago to be near his grandchildren. He had heart surgery earlier this year, and is recovering well. “He will turn 100 in May, and we would love to finish the film in time for this 100th birthday,” his daughter said. BIJAC is currently building the Bainbridge Island Japanese American Exclusion Memorial to mark the first location where Japanese Americans were sent to concentration camps. The memorial will be a National Park Service satellite unit of both the Manzanar and Minidoka national historic sites. BIJAC is continuing ongoing education efforts on the Japanese American experience through films, school programs, and other events. For more information, visit www.bijac.org/.